We just got back from South Carolina on Monday. We went up there to find a place to rent and I think we found one. We'll move back in about a month before school starts. I worked on Mary Roe a lot in the car on the way up. I just love this funky lady! I'm almost halfway done now. I just need to do couple more motifs and then the flower vine and verse. I made one little change - I ended up using Vanilla Pudding instead of Tumbleweed. My Tumbleweed dye-lot was a little too dark and gray. She's just a beauty!!!!! Glad you found a place to rent too :-). Love her! It must be nice to be able to stitch in the car. Wow! This is looking just great. I want to get mine out but I know I can't . I'll enjoy yours vicariously. Beautiful! I love the shepherd scene at the bottom. Making great progress. I really like the three half rounds at the bottom that are the base fot the blue flower tree. Nicole, your "Mary Roe" is indeed beautiful ... her colors are yummy and she does look like she's fun! Your stitching, as always, is perfect! Oh, she's so pretty! I just finished a BAP and now am wondering what to stitch next. Will have to see if Mary might be the one! I am jealous that you can stitch in the car! Mary is looking wonderful. She's a beauty, Nicolle! I love stitching in the car (as long as the roads are smooth!). Glad you found a place in S.C.
What a beauty!! And glad to hear that things are going smoothly with the move. Wish I could stitch in the car; I would be sick as a dog if I tried. Mary Roe is lovely Nicole. Isn't she such a fun stitch? Beautiful, just beautiful. So glad you found a place. Mary is coming along nicely. I love that Mary Roe. You can work in a moving car on 40 count and I can't while sitting still with a magnifier!! The colours in this design is just so cheerful. Beautiful stitching! Lovely stitching. I love the sound of the thread called Vanilla Pudding. Your funky lady is cute, but I'm in love with the pink dog (or is it a cat?)! Looking great! I used to be able to stitch in the car, many moons ago! She's a stunner that Mary!! 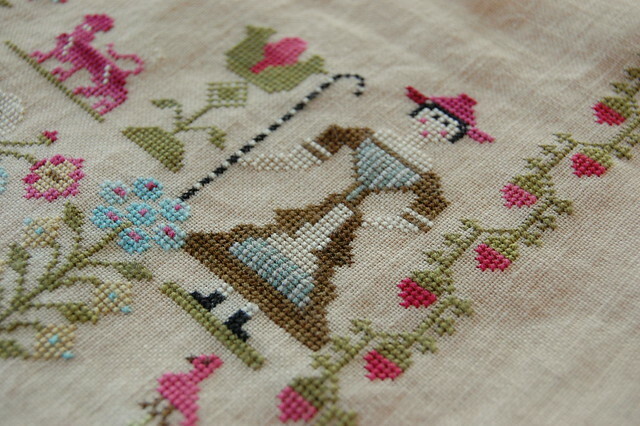 Love the colours in this sampler!! Oh what a beauty, she is really coming along. 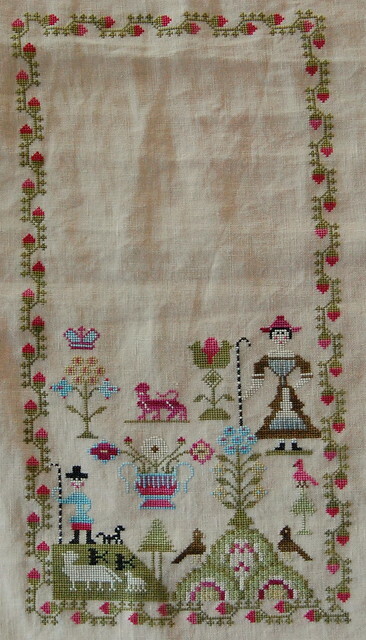 What a pretty sampler. I love that beautiful bright blue colour throughout.